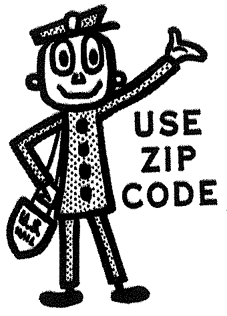 Today I found out what the “ZIP” in “ZIP Code” stands for and what the numbers signify. ZIP Code or “Zone Improvement Plan Code” was a system put in place by the U.S. Postal Service on July 1, 1963. The hope was that these ZIP codes would allow the postal service to more efficiently and therefore more quickly route mail. Before the official nation-wide ZIP code system, the U.S. Postal Service had a system of postal zones for large cities as far back as 1943. This postal zone number would be added to the address after the city name, but before the state name. (e.g. Bilbo Baggins, 3421 Bagend, Hobbiton 27, Eriador; where “27” is the postal zone within the city of Hobbiton) This allowed for more efficient sorting of mail and, thus, quicker deliver times in high volume areas. In 1944, post office employee, Robert Moon, submitted a proposal for a nation-wide postal zone system. In Moon’s system, which was eventually slightly modified and then adopted, the first three digits would stand for the sectional center facility (SFC); an SFC is just a central mail processing facility in a certain region. Specifically, the first digit ends up standing for a group of U.S. states (0-9 numbered from east to west, ascending) with the second and third digits representing a region in that group that is covered by some SFC. The Postal System then added on to Moon’s system two extra numbers which indicate the post office or postal zone, within the region, the mail should go to. Starting around 1983, the U.S. Postal service introduced the ZIP+4 system. In this system, the 5 digit ZIP code number signifies the same thing as before and the extra 4 digits at the end signify an area within a certain post office’s coverage area. Specifically, the six and seventh digits indicate a “delivery sector”, such as a group of streets; a group of office buildings; etc. The last two numbers then indicate a “delivery segment” which could indicate a floor of an office building; the side of the street the address is on; etc. This allows for more efficient sorting within a single post office that deals in high volumes of mail. The new ZIP+4 system never really caught on with the general public and is somewhat superfluous as mail today is read by a multi-line optical character reader (MLOCR) that can almost always determine the correct ZIP+4 code for an address. This machine also sprays a Postnet barcode on the face of the mail that corresponds to the full ZIP+4 code; thus, writing it in by hand before you mail something is generally no more efficient than not writing it in, because the automatic sorting systems the Postal Service has use this Postnet barcode, rather than the specific written address for sorting. Great idea for an article! I had been wondering about zip codes, but I kept forgetting to look it up. My question: Wouldn’t the zip be required if the scanning system can’t read the CITY of the addressed envelope? I’ve seen mail in our office for a street that runs from Long Beach through Carson but gets determined it must be for a city in Northern CA with the same street name. I wouldn’t encourage people to mail anything without a zip! @KaRi – yet its always good to include at least the 5 digit ZIPcode on any mail you send. While it is redundant – thats the whole point – it serves as a “backup” way to verify the mail is being sent to the proper destination, especially if there is a problem reading one or the other. Note that the house number is also used, in addition to the city, street, etc. The USPS OCR systems are VERY powerful – but its always a good idea to write as clearly as possible (or better, PRINT the address on a label with a computer) and leave no room for error. For a package, I would put the destination address on two different sides of the package, as well – this both adds redundancy and increases reliability. Corrections. The abbreviation for “Sectional Center Facility” is SCF, not SFC. MLOCR’s have been obsolete for some time. The OCR systems the USPS uses today, for letters, large flat mail, as well as packages, are several orders of magnitude more powerful and faster. If you *are* going to print a barcode on a letter, never print it along the bottom edge where the Postal systems do – instead include it in the address block. Avoid including any other barcodes on a mailpiece, as these can sometimes be misinterpreted by sorting systems. but the final two digits (25, in this case) are never printed as part of the address, they are only encoded in the full postnet code when printed.